Rachel hates her life and everyone in it - she even has suspicions that her on/off boyfriend David might not be entirely trustworthy. However, when David invites her to a music festival in England featuring their friend's band, she jumps at the chance for an overseas adventure. Hoping to surprise David, Rachel arrives at the festival early, where she runs into a nasty surprise of her own - she sees David kissing their friend Jo. Distraught, Rachel runs off, wishing she could leave her life behind... the next thing she knows, she's back with David. But not as herself... She's now in Jo's body! 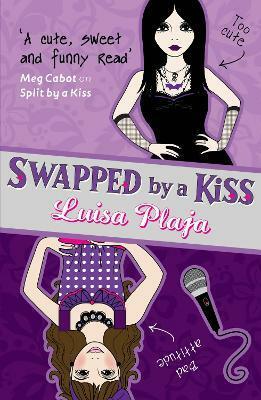 Can she keep the swap a secret from David until she can work out exactly what's going on and get her revenge? Over the course of a very weird weekend, Rachel puts herself in someone else's shoes and finds that her own maybe weren't as uncomfortable as she'd always thought. But can she ever be herself again? "Exciting, funny and filled with great characters, Swapped By a Kiss will keep you entertained right until the very last page"
Luisa Plaja lives in Devon with her husband and two young children. She is a huge fan of teenage chick-lit, and loves reading, writing and pretending she can do things she can't, like ice skating and telling jokes.